The estimated cost of running a clinical trial in the United States ranges from $20 million for a Phase I trial, to $100 million for a Phase III trial. Each year, clinical trial sponsors invest millions of dollars to improve the efficiency and reduce the costs associated with running trials through the use of technology. Ennov’s Clinical suite provides sponsors, CROs, investigators and patients with a comprehensive, end-to-end solution for the capture and management of all clinical trial information, both structured and unstructured, from the earliest stages of planning through execution and close-out. The Ennov Clinical suite consists of Clinical Data Management applications (Ennov EDC, Ennov RTSM and Ennov ePRO) as well as Clinical Trial Management applications (Ennov CTMS and Ennov eTMF) that are available for deployment in the cloud or on premises. Our Ennov Clinical eLearning application completes our innovative software product suite. 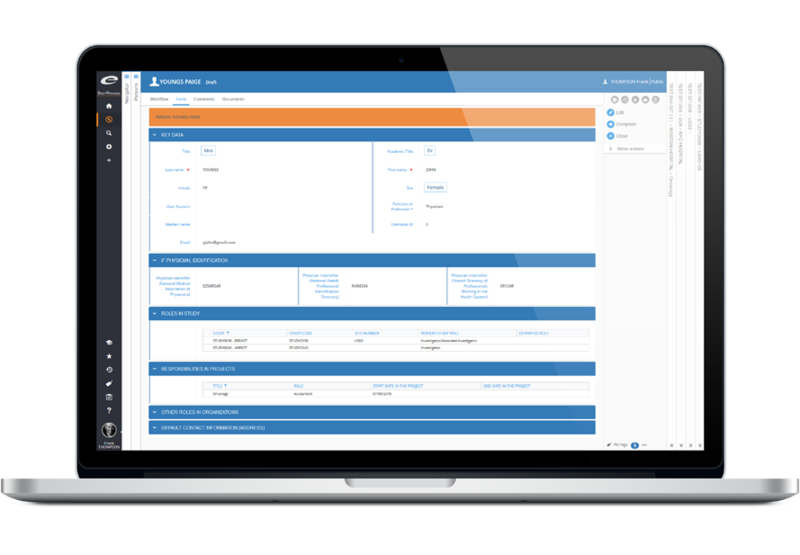 A single authoritative source: Manage and track all Clinical data, documentation and processes within a single solution to streamline clinical operations and increase efficiency. Increased visibility: Gain valuable insights into clinical operations to identify and prevent problematic trends before they lead to quality issues. Create an EDC study and collect clinical trial data without the worry of compliance, traceability, missing or inaccurate data. With Ennov EDC, data managers can easily design, deploy, and capture multi-center clinical trial data using one comprehensive solution. Ennov EDC is eCRF software that can support clinical trials of any size, including very large and complex global trials. Ennov EDC helps facilitate the capture of more complete and accurate data while improving communication among clinical teams. Ennov EDC working in tandem with Ennov ePRO, patients can record their own diaries and quality of life assessments. Ennov EDC software significantly streamlines randomization, trial design, consistency tests, medical coding (MedDRA, WHO Drug), data import and export. 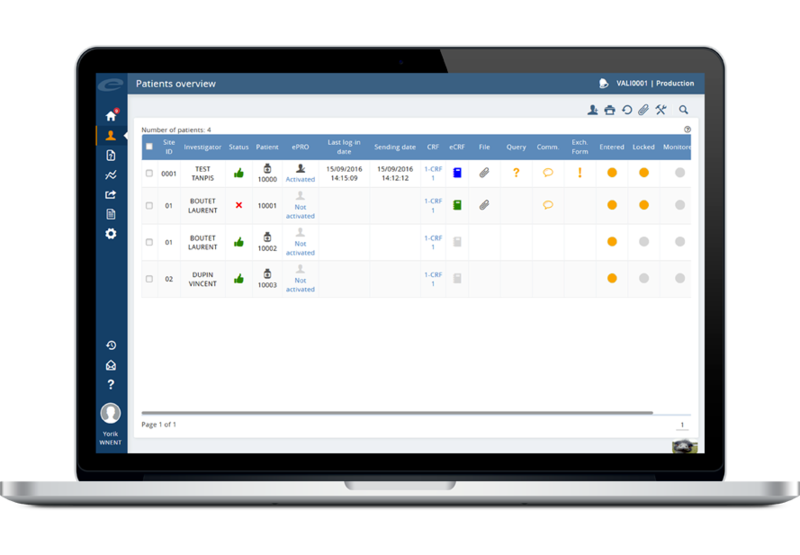 Ennov Clinical embeds a system for a direct patient randomization within our eCRF software. Our IWRS (Interactive Web Response Service) provides many options, such as controlling eligibility through consistency pre-tests, choosing strata and randomization method (blocks, minimization), activating the ”Randomization Factor” and managing investigational product supply. Our software makes it easier to manage a double-blind study and prevents any anticipation of later allocations. With Ennov Randomization module, you can have a global view of the randomization among all patients (i.e., success or failure) or at the individual patient level (various randomization operations or drug allocations). Self-reported patient data are an important aspect in measuring drug efficacy and assessing the quality of life in clinical trial subjects. However, the use of paper-based assessments can be cumbersome and difficult to manage, especially in large, complex global clinical trials where patient compliance can be a significant challange. Ennov ePRO software automates the capture of electronic patient data through the use of online questionnaires that patients can complete from the privacy of their own home. 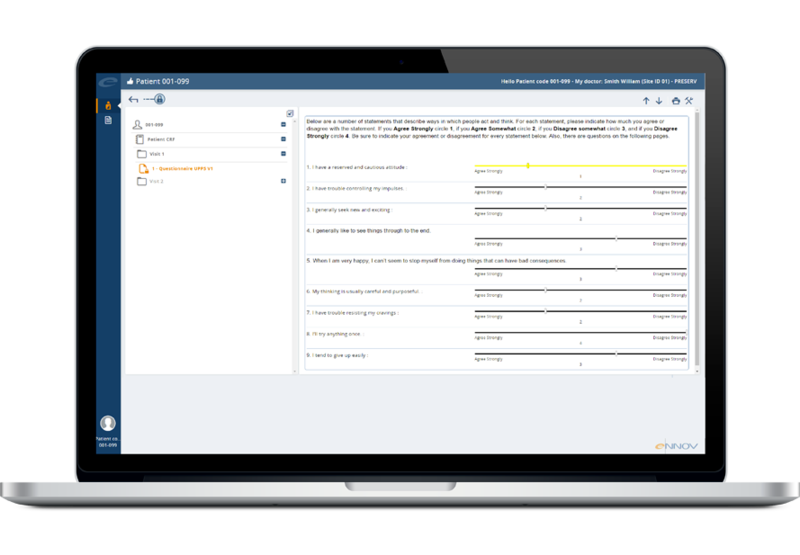 These questionnaires use the same easy-to-use form designer as Ennov EDC and makes patient data available to investigators and trial sponsors immediately upon completion. Each year, clinical trial sponsors search for new ways to improve the efficiency and reduce the costs associated with running their trials. Investigational site efficiency and productivity can be improved by centralizing information, actively monitoring progress, automating schedules, managing finances, and providing accurate reporting and metrics. 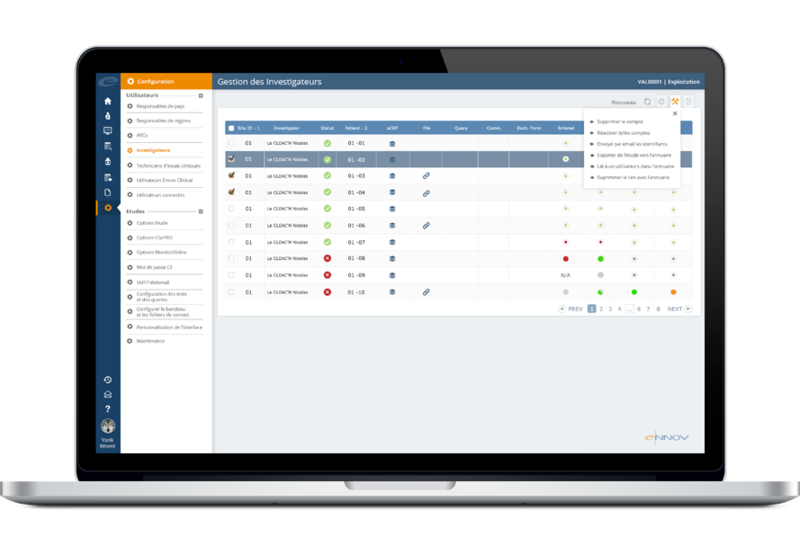 With the Ennov CTMS, trial sponsors and CROs are able to actively address all aspects of trial management from a single platform: investigator sites, patients, SAEs, deviations, inclusions, visit reports, phone contacts, investigational product management, trial facilities, and finances. Study managers can plan and track their trials in real time to make better decisions faster. 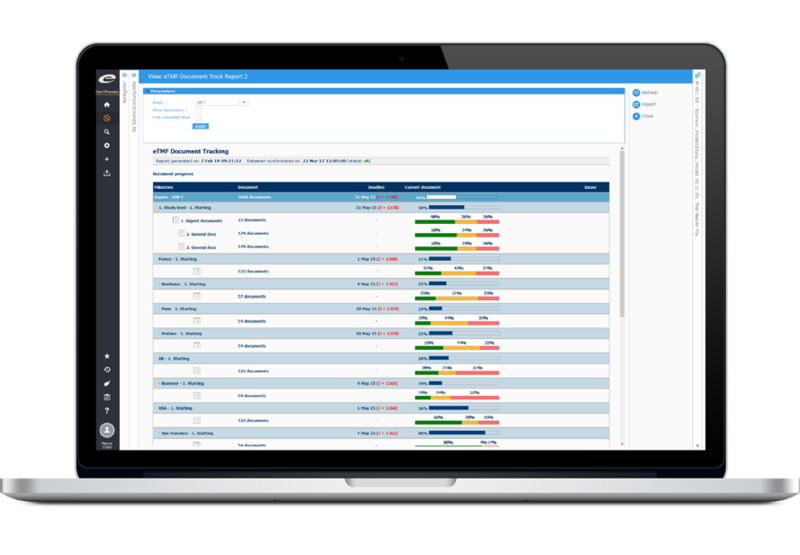 With the Ennov CTMS dashboard functionality, study personnel get on-demand analytics to improve quality, control risk, and reduce costs. Management of essential trial documentation is, indisputably, one of the most time consuming and costly activities associated with conducting a clinical trial. ICH E6 guidance on Good Clinical Practice (GCP) specifies an inventory of over 200 discrete documents that must be managed before, during and after the trial. Any or all of these documents must be available for audit by the sponsor and for inspection by the regulatory authorities, and considering the massive volumes of documentation involved in the process, the effective management and exchange of study documentation can have a significant impact on the cost and time to complete a clinical trial. Ennov eTMF leverages the power of Ennov Doc, our comprehensive yet easy-to-use EDMS to provide our clients with ability to take control of their clinical trial documentation and always be inspection ready. 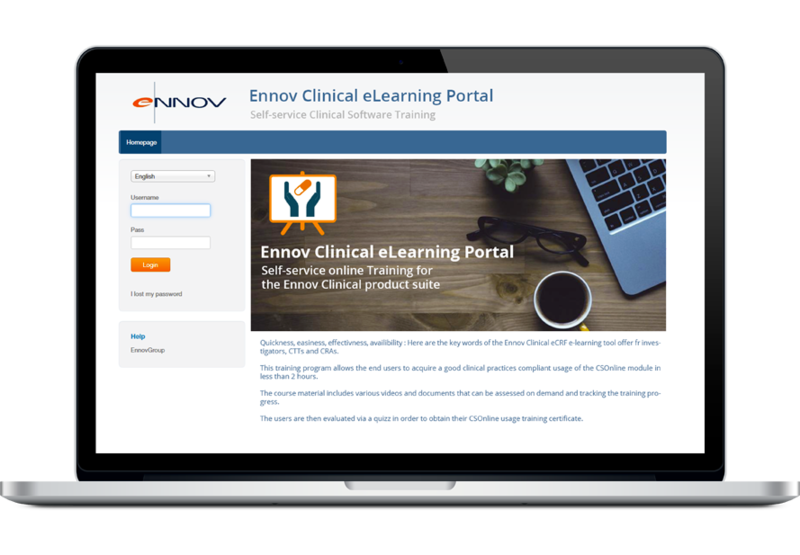 Ennov Clinical eLearning is an original and interactive learning experience that ensures the uniform training of every member of your clinical team. The Clinical eLearning application provides remote learning capabilities, using the latest web and multimedia technologies which allows our clients to vary the modes of learning to keep trainees interested and engaged. Ennov Clinical Learning includes complete courses dedicated to the use of our Clinical solution suite. Each has been created to accelerate the ramp-up of clinical personnel involved in the execution of your clinical trials.